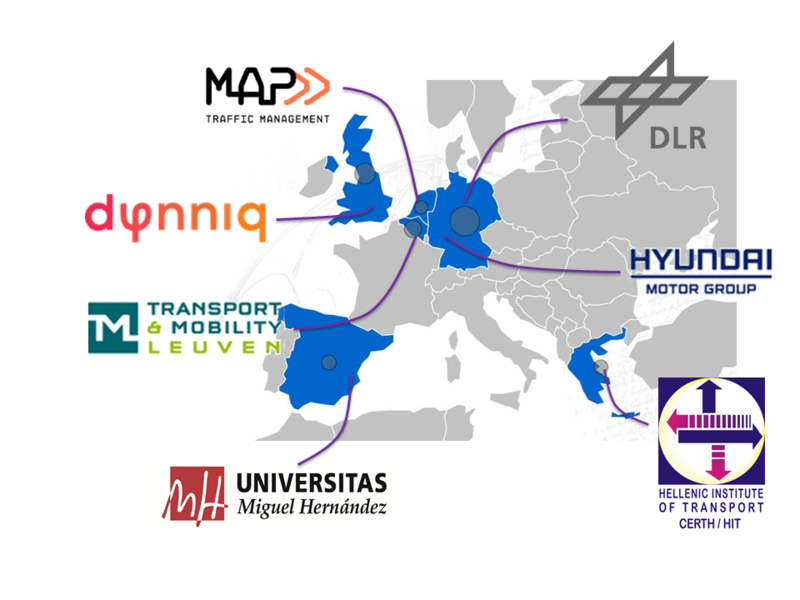 The TransAID Consortium consists of 7 partners from 6 European countries: DLR, CERTH, Dynniq, Hyundai Motor Group European Technical Center, MAP Traffic Management, Transport & Mobility Leuven, and Universitad Miguel Hernandez de Elche (UMH). In addition, there are also 12 associated partners: Attikes Diadromes, Car2Car-Communication Consortium, DGT, ECTRI, EURECOM, Huawei, IKUSI, ITS Niedersachen, Region of Central Macedonia, Rijkswaterstaat, TRL, and University of Twente. The German Aerospace Center is the national centre for aerospace, energy and transportation research of the Federal Republic of Germany. The Institute of Transportation Systems (DLR-ITS) was founded in 2001 and is located at the research airport in Braunschweig, Germany. Scientists and engineers from interdisciplinary teams develop new customer oriented approaches to increase the safety and efficiency of road and rail traffic. The institute's research efforts range from basic research, across concept and strategy development, to prototype implementation. These activities are strongly oriented towards the needs of enterprises and the society. The activities concentrate on the development of advanced driver assistance and automation systems, but also on traffic simulation e.g. by using SUMO, the open source microscopic traffic simulation software initially developed in house. The research provides information about conformance to standards and specifications as well as the interoperability of the considered components. To support this work, the Institute of Transportation Systems operates the large-scale test site Application platform for Intelligent Mobility (AIM) in Braunschweig, Germany. AIM combines more than 20 services like V2X infrastructure, traffic monitoring and management as well as simulation models and fundamental data. DLR-ITS is the coordinator of TransAID. Besides, the institute is technically working on traffic simulation, communication, vehicle automation and real world prototype implementation, which leads to involvement in nearly all tasks and work packages. Because of its role in the development of SUMO and the existing knowledge on simulation platforms, DLR-ITS is leading the work package 6. As the AIM test site and part of the research vehicles are operated by DLR as well, it is also the ideal partner for leading work package 7. The Centre for Research and Technology Hellas (CERTH) is a non-profit private status legal entity (the largest research centre in Northern Greece) supervised by the General Secretariat for Research and Technology. It incorporates Institutes dedicated to promoting fundamental and applied research in a variety of fields, as well as to developing novel services of industrial, economic and social importance. CERTH has been designated as HR Excellence in Research centre. The Hellenic Institute of Transport (HIT) is one of the institutes of CERTH, which is devoted to the promotion and execution of transport research. The main scope of CERTH-HIT is to provide state-of-the-art research and create innovation in the field of transport in Greece and abroad. Furthermore, its mission is to produce scientific results, implementable outcomes, specialized knowledge, support policy and decision making in the transport field. 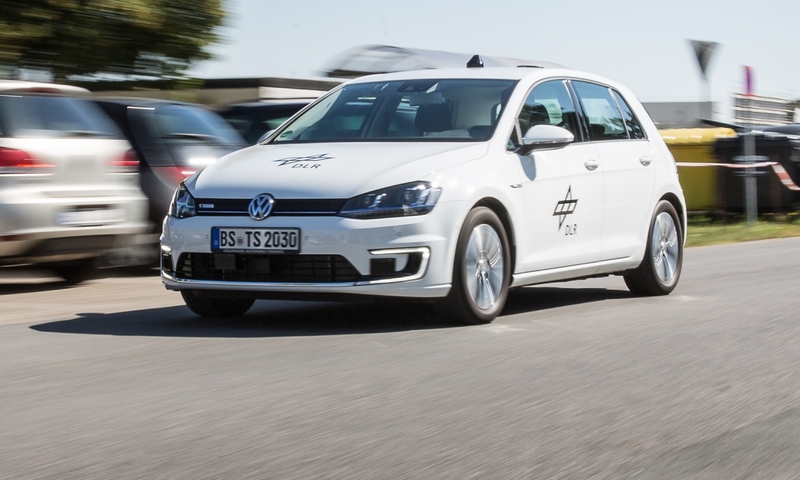 CERTH/HIT being the leader of WP3 is going to focus on the modelling and simulation of vehicle automations and automated vehicles’ driver behaviour that is going to be conducted with the use of SUMO. CERTH/HIT will develop and simulate the base case scenario (i.e. interactions of connected and automated vehicles in the absence of hierarchical management) of the simulation experiments and propose KPIs for assessing traffic efficieny and safety of automated driving at Transition Areas. Moreover, CERTH/HIT is going to simulate cooperative maneuvering of connected and automated vehicles and assist to the interface of the SUMO models with the integrated simulation platform iTetris. Finally, it will be involved in the dissemination activities of the project. Dynniq is a technical systems and service provider in the domain of ITS and Energy. It combines electrical and mechanical engineering and ICT to the best solutions for moving people, materials, energy and data flows. Dynniq provides services throughout the entire technology life cycle and business processes with customers, and operates in the following markets: dynamic transport and traffic management, cooperative systems, automated driving, energy (incl. smart grids), parking systems, public lighting. Dynniq works at interurban and urban roads, airports, rail, water and parking facilities and energy distribution networks. With more than 1,800 professionals Dynniq is working for nearly 1,000 customers in and outside Europe and achieves annual revenues of around 400 million euro. Dynniq is active in The Netherlands, Belgium, the United Kingdom, Ireland, Denmark, Sweden, Finland, Poland, Croatia, Russia and other countries in Eastern Europe. Dynniq is also engaged in activities outside Europe. Dynniq UK Ltd is a company under Dynniq Group. It has two Liked Third Parties (Dynniq Nederland BV and Dynniq Peek Traffic BV) in TransAID. DYN is the WP leader of dissemination and exploitation. It will also play the role of Exploitation and Innovation Manager (EIM) in TransAID. It will mainly contribute to the following tasks: development of enhanced traffic management measures, V2X message sets definition, cooperative sensing for improved detection of vehicles, signalling for informing conventional vehicles, real-world prototype architecture and requirements, road-side automation, real-world prototype integration and feasibility assessment, communication and exploitation management, dissemination strategy, planning and tools, dissemination channels, liaison with other projects and initiatives, knowledge transfer, and dissemination events, and the exploitation plan. Hyundai Motor Europe Technical Center GmbH (HMETC) is the local technical development branch of the global carmaker Hyundai Kia Motor Company (HKMC) in Europe. As such, HMETC supports the development of HKMC passenger and commercial vehicles for ensuring their adaptation to the European market. This support ranges from customer and market research study, analysis of EU regulations, development projects with tier 1 and 2 suppliers, up to test and validation of new vehicle models. The main fields of HMETC development are powertrain, vehicle electronics system, engineering design, vehicle test, and vehicle design. The HMETC responsible department for the TransAID project will be the Electronics System Development (ESD) department. ESD focuses on the development of innovative Infotainment, Active Safety/Advanced Driver Assistant Systems (ADAS) and Human Machine Interface (HMI) concepts with the goal to provide the best possible customer driving support, while ensuring safety and avoid driver distraction. Within ESD, the ADAS team is involved in the development of active safety functions like Autonomous Emergency Braking and Lane Departure Warning currently driven by legislation (Euro NCAP) as well as those relying on new and future technologies such as Map-based ADAS and Car2X. The followed approach is integrating these systems and sensors into Hyundai cars by considering the best possible technology combination with the most efficient software fusion solutions. Overall in the development process the whole work flow is covered, from specification creation via testing/validation (inside the laboratory/inside the car) up to the system release and system launch support of cars. Currently HMETC is member of the ADASIS forum as well as the Car2Car Communication Consortium and ETSI ITS. Taking advantage from its expertise, the main role of HMETC will be supporting the modelling, development and testing of the functionalities enabling the envisioned TransAID traffic control strategies. In particular, HMETC will study suitable V2X communication schemes and message sets as well as enable the integration of the TransAID functionalities on Hyundai vehicles and participate to their validation in a system prototype assessment. Moreover, HMETC will contribute to the overall system definitions and requirement specification by representing the needs and vision of the automotive industry. MAPtm, founded in 2010 is a SME and service provider in the domain of Traffic Management. Apart from traditional Traffic Management MAPtm explores new, innovative services based on for example Data analytics, Social Media, Mobility as a Service and C-ITS. MAPtm operates as an independent partner for road authorities, national and local governments, municipalities and contractors. MAPtm is active on the complete chain of Traffic Management, from the design phase, including development of new smart algorithms, up to the exploitation and operation. MAPtm has implemented its own Traffic Control centre from where Traffic Management Systems from different cities can be operated. MAPtm is active in national and international architecture and standards development for C-ITS deployment, partakes in several EU-funded research and innovation projects and frequently supports Rijkswaterstaat with their work in the Amsterdam Group and Car2Car consortium. MAPtm is leading WP2 on scenarios, use cases and requirements and WP8 for developing a guideline and roadmap. MAPtm will primary focus on and represent the traffic management and local authorities perspectives. In addition, MAPtm will contribute to the specification of connectivity and signalling techniques and standards which support the traffic management measures. Transport & Mobility Leuven NV (TML) conducts applied research to support policy decisions. It is our mission to help society by offering scientifically sound analyses. To this end, we rely on quantitative research: modelling, statistical analyses, simulations, and prognoses. Our research fields are traffic, passenger and freight transport and the related economic impact and environmental problems. The integration between passenger and freight transport, economics and environment gives us a unique position within Europe. Transport & Mobility Leuven was founded in 2002. The largest shareholder is the Catholic University of Leuven. Their expertise has been combined and further applied to support policy decisions. Our excellent relation with our shareholders guarantees that TML is always up-to-date with the most recent state-of-the-art. Our focus is both scientific and practical: we are the bridge between the university and society. Our clients are the European Commission, national governments and administrations, local and regional authorities as well as sector associations and non-profit organisations. They base their policy on our analyses and prognoses. We conduct our projects with great concern for independence and openness. Transport & Mobility Leuven is not associated with road construction companies, economic sectors or political parties. We think it is important to communicate self-critically and openly on our methods and sources. We clearly communicate not only our end results, but also our intermediate results and methods. Our research results thus instil insight and trust, and can thus be defended. TML’s role in TransAID mainly falls in the following categories: (i) dynamic modelling of driver behaviour (in relation to autonomous vehicles and various levels of autonomy), (ii) impact assessment of various traffic management strategies on the levels of congestion, emissions, traffic safety (cf. external costs), and (iii) leading dissemination activities. The Universidad Miguel Hernandez de Elche (UMH) is a public Spanish University mainly focused in Engineering, Health Sciences and Biotechnology. The Ubiquitous Wireless Communications Research (UWICORE, www.uwicore.umh.es) laboratory is part of UMH’s Department of Communications Engineering. The research activities at the Department of Communications Engineering span the areas of mobile and wireless communications, microwave and antennas, signal processing and optical communications. UWICORE is a research laboratory dedicated to the development of advanced solutions for mobile and wireless communications and networks. UWICORE research expertise includes multi-hop wireless communications, resource management and medium access control, networking protocols and algorithms, and system design and optimisation. This technical expertise is mainly applied to the following areas: vehicular networks, multi-hop cellular networks and Device to Device Communications (D2D) for 5G, and wireless industrial communications and networking. UWICORE closely collaborates with national and international companies, and devotes significant efforts to experimental research, and hardware and software prototyping. UMH is a member of ETSI, and the UWICORE laboratory actively follows developments within ETSI’s Technical Committee on ITS. UMH main contributions will be the design, implementation, test and optimization of V2X communications in TransAID. This includes the design of the necessary messages sets and facilities, message flows between vehicles and between vehicles and the infrastructure, and communications and networking protocols for ensuring reliable V2X communications. UMH will also participate in the design of cooperative sensing schemes exploiting V2X communications. UMH will participate also in the software integration of the design V2X communications and networking solutions, and in their implementation in hardware prototypes. UMH has extensive research expertise in V2X communications and networking, including the design of advanced hardware prototypes, and software integration in hybrid simulators combining wireless and traffic simulation capabilities.